Make: FN, In Belgium, for Browning. 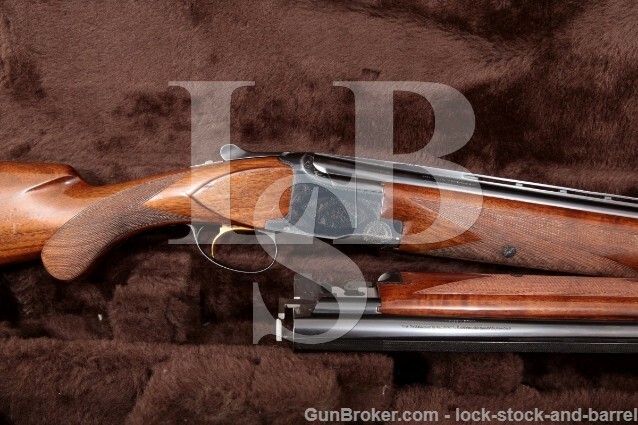 Action Type: Over / Under, Top Break Shotgun with Ejectors & Single Selective Trigger. 28″ Barrel Set: The left side of the upper barrel is marked “BROWNING ARMS COMPANY ST LOUS Mo & MONTREAL P.Q. / MADE IN BELGIUM”. The left of each barrel under the forend is marked with “E / L G / *” and “12-70” in ovals. The left of the top barrel at the rear edge is marked “**” and the bottom “**-“. The bottom-left of the monoblock is marked “22369 S4 / S 2”. The underside of the cocking lifter is marked “22369S4” and “2”. The right side of the forend latch is marked “22369S”. The right side of the top barrel is marked “SPECIAL STEEL-12 GA-SHELLS 2 3/4″ / PATENTS No2203378-223386″. 30″ Barrel Set: The left side of the upper barrel is marked “BROWNING ARMS COMPANY ST LOUS Mo & MONTREAL P.Q. / MADE IN BELGIUM”. The left of each barrel under the forend is marked with “E / L G / *” and “12-75” in ovals. The left of the top barrel at the rear edge is marked “*” and the bottom “**”. The bottom-left of the monoblock is marked “22369 S4 / S 1”. The underside of the cocking lifter is marked “22369S4” and “1”. The right side of the forend latch is marked “22369S”. The right side of the top barrel is marked “SPECIAL STEEL-12 GA-CHAMBERED FOR 3″ MAGNUM / PATENTS No2203378-223386”. The receiver has Grade I scroll engraving, the underside is marked “BROWNING” with a bust portrait of John Browning. The water table is marked with Belgian proofs. The upper tang has the serial number. 28″: Fixed Improved Modified over Modified. Sights / Optics: Each barrel set has a steel bead mounted at the front of its vent-rib. The tops of the ribs are checkered to reduce glare. Stock Configuration & Condition: The stocks are checkered walnut with round-knob pistol grip, straight comb, brown ventilated rubber Browning recoil pad. The 28″ barrel set’s forend has many scattered light compressions, drag lines, bruises and scuffs with some scattered spots of white and green residue. Some of the bruising is in the checkering but for the most part the checkering is well defined. The 30″ barrel set’s forend has fewer scattered light compressions, drag lines and scuffs, also with some scattered spots of white residue. The checkering has a few spots slightly smoothed from handling but is mostly sharp. The buttstock has many scattered light-moderate compressions, bruises, drag lines, scuffs and scrapes, heaviest along the toe-line and also has scattered spots of white residue. There are no chips or cracks. The LOP measures 14 1/8” from the front of the gold-plated trigger to the back of the recoil pad. The pad has hardened with age and has wear around the edge, in about Good-Very Good condition. The drop at heel is approximately 1 1/2″ and the drop at comb is approximately 2 3/8″ with both barrel sets. The stocks are in about Good-Very Good overall condition. Bore Condition: The bores are bright, there is no erosion. Overall Condition: This shotgun set retains about 80% of its metal finish. The finish is thinning at all edges. The 28″ barrel set has some nicks along the edges of the rib, several scattered light marks, a line of wear along the left of the top barrel, light wear on the bottom immediately in front of the forend from disassembly, and a few scattered impact marks (not visible in the bores). The 30″ barrel has a few scattered light marks, 3″ of light scratches on the left of the top barrel approximately 6″ from the muzzle and a few very light nicks on the edges of the rib. The receiver has finish wear on the safety switch, the top of the lever’s thumbpiece, the front face of the trigger and at the bottom-front with scattered light marks in the remainder. The screw-heads are sharp. The markings are clear. Overall, this shotgun set rates in about Very Good condition. Mechanics: The action functions correctly with both barrel sets. The shotgun features a single selective trigger and ejectors. The action closes with a satisfying ‘clunk’ with both barrel sets, indicative of FN’s legendary craftsmanship, resulting in zero movement between the barrels and frame. We have not fired this shotgun. As with all used firearms, a thorough cleaning may be necessary to meet your maintenance standards. Box, Paperwork & Accessories: This shotgun comes with a faux-leather vinyl covered hard-sided fitted case with brown fleece interior, sections for each barrel set, the stocked receiver and two accessory compartments. The exterior of the case has some scattered light scuffs with a more moderate scuff on the bottom, intact stitching, and little wear on the interior, in about Very Good overall condition. Our Assessment: After the death of John Browning, his son Val would complete an over under shotgun with a single selective trigger and ejectors; the Superposed was introduced in 1931, it was an instant success; the factory did not produce any of these shotguns during WWII but just after the war ended, the factory came roaring back to life, creating some of their best product to date. This is a post-war FN produced 12 Gauge set from 1964, in about Very Good condition, showing tight metal and wood fit, the action is still spot on and the trigger is crisp. Val’s SST is still known as one of the most reliable and ingenious of its kind, even though the patent is nearing 100 years in practice. This shotgun set is in about Very Good condition showing evidence of extensive but responsible use with the 28″ barrel set, significantly less use with the 30″ set and comes with a nice Browning fitted case. This shotgun has clearly served its former user well for a good long time and there’s no reason to think that it won’t do the same for lifetimes to come. Please see our photos and good luck! CA Legal or CA Private Party Transferable: This C&R eligible shotgun can be transferred in California. All cartridge firing firearms including C&R and Antiques must be DROS’d at an FFL. This does not apply to out of state residents.